Research scholars of Calicut University are on a sit-in against the severe anti-students policies including attendance through Bio-metric system. The indefinite protest began on Tuesday, backed by Kerala Legislative Assembly Member P. Sree Ramakrishnan. 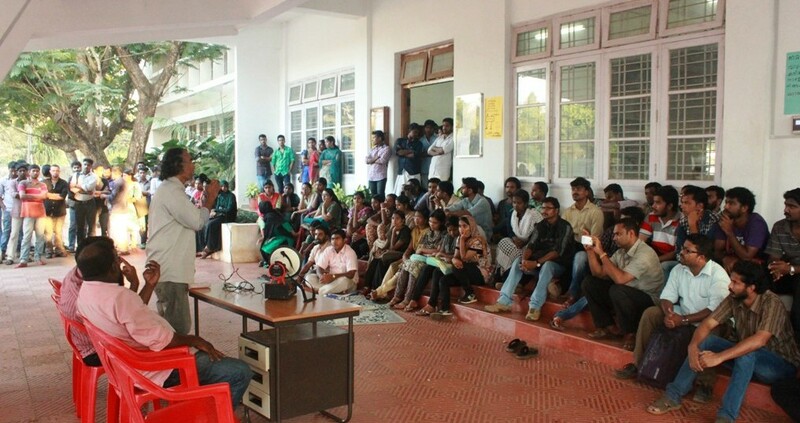 The research students under All Kerala Research Students Association (AKRSA) have come with a new method of agitation, Day and Night research protest by occupying the university’s central library. This ensued a number of agitations such as the bhiksha edukkal gaveshanam (begging research) Pattini gaveshanam (hunger research) etc. This protest started on last Monday and entered fourth day and all are stern to sit-in until their demands are accepted. They demand to stop the attempt to cancel the fellowship according to attendance by punching (Bio-metric attendance system); withdraw the decision not to provide fellowship for those who admitted in 2014 and bind the research guide the power to grant duty leave to students. They also urge the proportional hike in the fellowships and to bar the decision to discontinue M. Phil fellowship. Since a university aims to discovery, dissemination and application of new knowledge, the authority should provide necessary facilities for independent research activities to fulfil those aims. But not only in Calicut University but all over India we can see a negative attitude towards research scholars from authorities. The grant of fellowships including junior research fellowship (JRF) of UGC disburses to eligible students after suffering a lot of headache. This indeed affect the research out-come of our universities. In particular universities like Calicut University further put forward strict and repressive policies for researchers and thus curtail scholar’s freedom. Calicut University provides only Rs 4,750 for PhD students as fellowship. This is indeed insufficient for an ordinary person to live nowadays. Instead of increasing the fellowship, university administration decided to discontinue the fellowship if student fails in attendance according bio-metric attendance system. Interestingly these orders do not in effect for those affiliated institutions under this university. The protest progresses as passive reading in library and conducting lectures on various subjects for helping research scholars. The scholars themselves prepare food in front of library and sleep inside there. Apart from K.E.N., Dr. E. Sreekumar from the department of life science in Calicut University took class on ‘Environment and Pollution’ and Dr. Azeez Tharuvana from Farook College talked on ‘Research’. M.B. Rajesh MP also addressed the protest. ‘The protest will be addressed by several prominent personalities in coming days,’ said the organizers. ‘This protest is noticeable in the situation where people passively accept authoritative decisions. But we believe only big-mouth will get milk,’ they added. Scholars Sanjay, Jamsheed Ali, Rovith etc are leading this protest. However, University has a steady growth in last few years especially under this Vice Chancellor. Several developmental activities started. Somehow efficiency is generally seemed in the overall process of university. While some group appreciate progressive attitude of VC others criticize his authoritative nature in taking decisions. Unlike previous VCs Dr. Abdul Salam could implement some orders without considering political color despite strong opposition from students and staffs. This has resulted in the positive growth of university. The VC, however, cannot ignore the growing discontent from the campus due to some decision without considering students’ demand and grievances such as the crisis in research activities. VC should come to students and hear them. All voices should consider before taking any decision/action. Otherwise the stern stand may in vain. The growth of any institution especially university is the result of sincere attempts of all stakeholders together. No VC could alone lead university topmost. Calicut University in Kerala has witnessed several protests by students, staffs and political organizations in the history of 46 years. Due to the continuous agitations in campus, the vice chancellor Dr. M. Abdul Salam had restricted agitations at least 200 meters away from University buildings by a High Court verdict last year. But the protest marches often block the main gate of university after that. The university is infamous for its anti-students/teachers/staff policies. The postponements in conducting exams, delaying in declaring results, mistakes in question papers and certificates etc are regular issues from university. क्या मोदी इस बार सांसद भी बन पाएंगे?